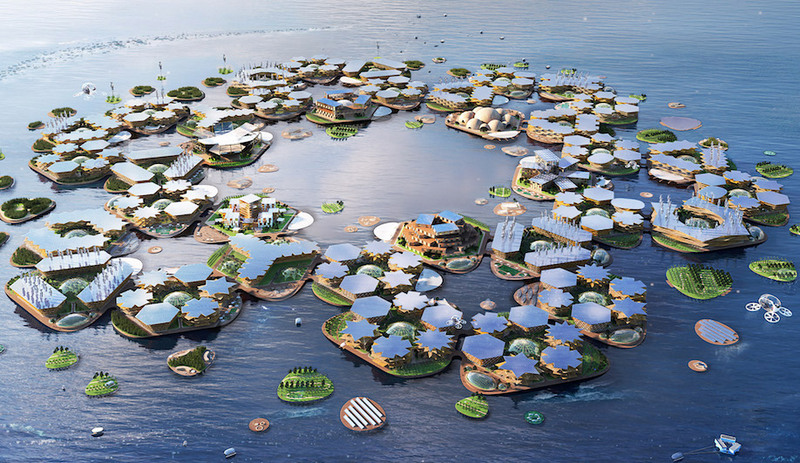 That city is also seeing a surge of development. 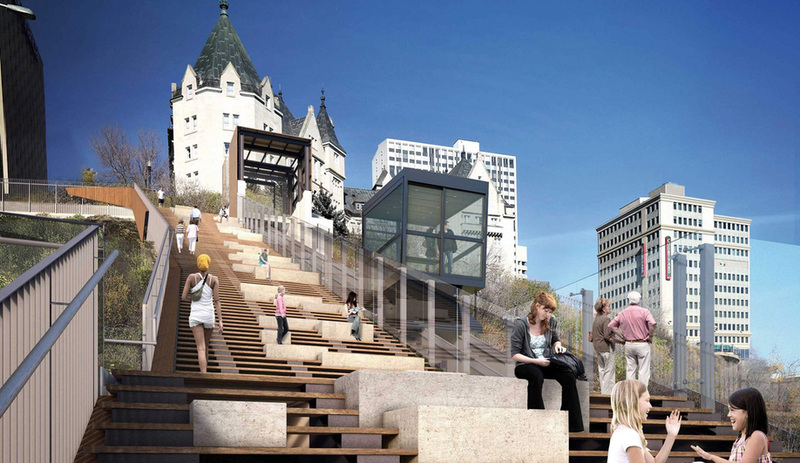 And just as the soon-opening Royal Alberta Museum, the Stanley A. Milner Library revitalization and Kasian Architecture’s Arts Habitat promise to connect the city to cultural spaces, the 100 Street Funicular hopes to bring Edmontonians closer to its most vital green spaces. 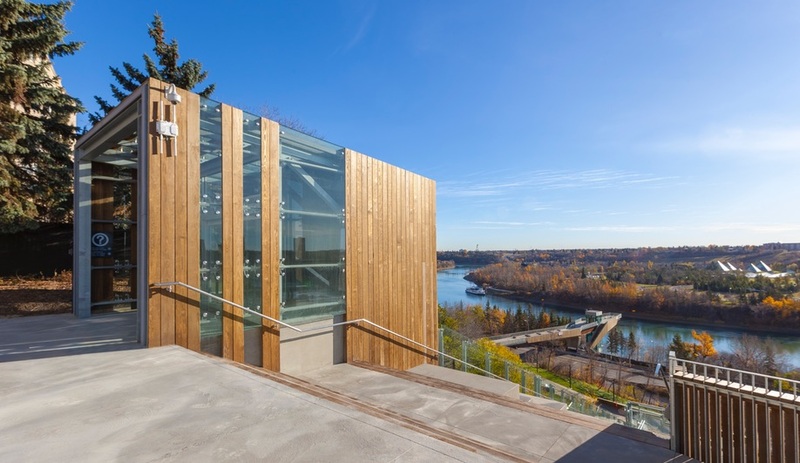 Designed by Dialog – an interdisciplinary firm with fingerprints on a number of Edmonton projects, including the Walterdale Bridge, Norquest College and the aforementioned Royal Alberta Museum – and built by Graham Construction, the $24 million site opened to the public late last year. Sitting at the foot of the historic Fairmont Hotel McDonald, the project, which is part of the River Valley Alliance’s long-term plans to increase connectivity with the city, provides mechanized access to the myriad trails below. Each ride on the 100 Street Funicular takes about 36 seconds from top to bottom, with each cabin travelling roughly two metres per second. While descending, it generates energy that Dialog says “goes back into the grid.” The funicular was designed with accessibility in mind: the cabin is roomy enough to carry wheelchairs, strollers, walkers and bikes, a fact that inspired a jingle about it. 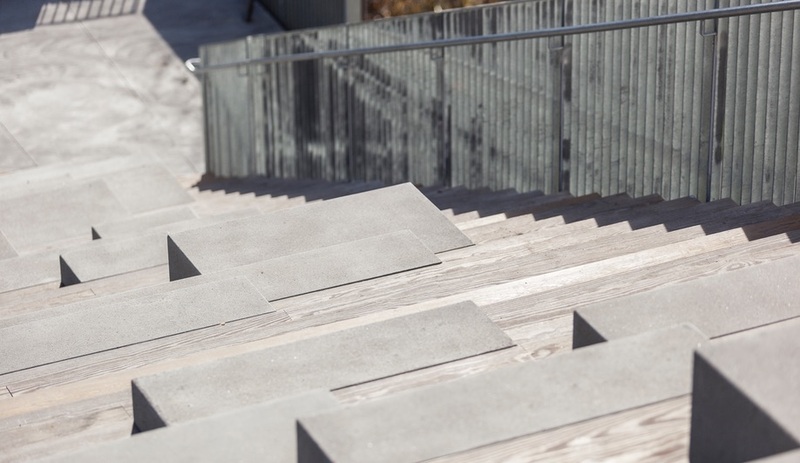 The funicular is accompanied by a staircase studded with concrete boxes, inviting pedestrians to linger. 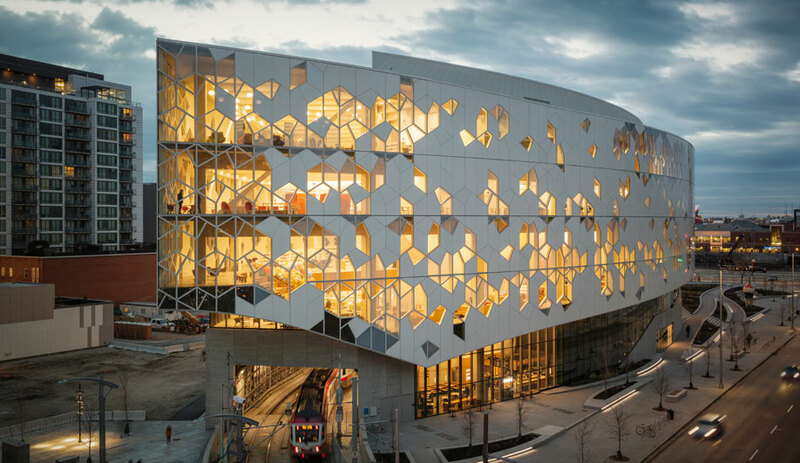 The 170-step staircase (and the cladding used throughout the site) is made from Kebony, which Dialog says provides “excellent dimensional stability and resistance to rot,” lasting six times longer than pressure-treated wood. 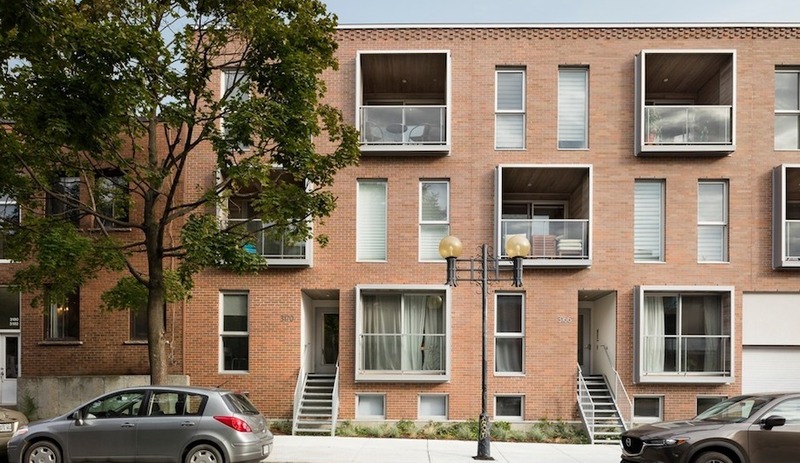 The material is also known for its resistance to cold climates – a necessary feature for a city whose average low dips to -13 in February. 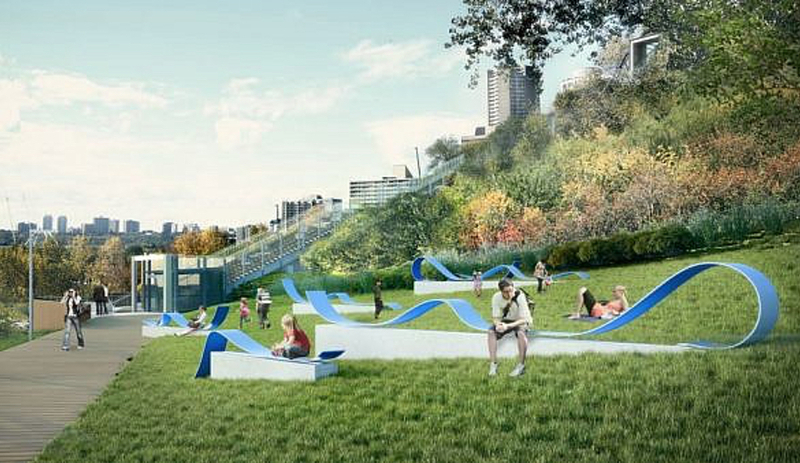 At the foot of the funicular, a promenade unfolds, which the firm calls “a meadow tucked in the riverbank.” Here, Vancouver visual artist Jill Anholt contributed Turbulent, a public-art installation that doubles as benches. Floating on concrete podiums and lit from below, Anholt’s work is inspired by the flow of water. 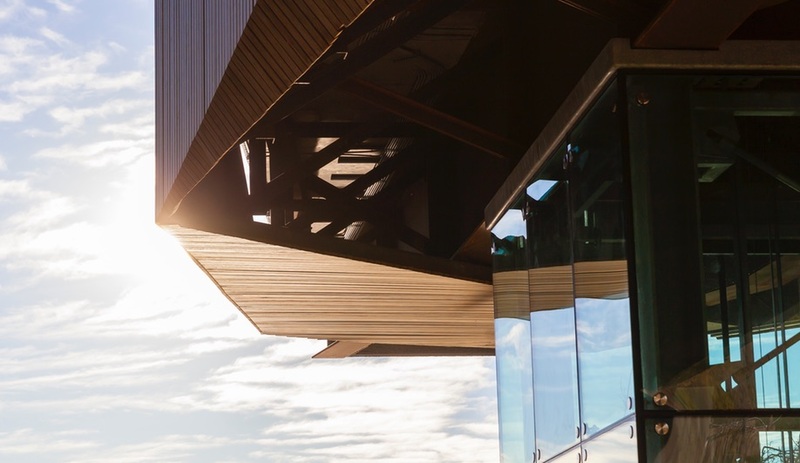 The promenade leads to one of the site’s most prominent features: the Frederick G. Todd Lookout, named for the landscape architect who developed North Saskatchewan River Valley’s considerable park system. 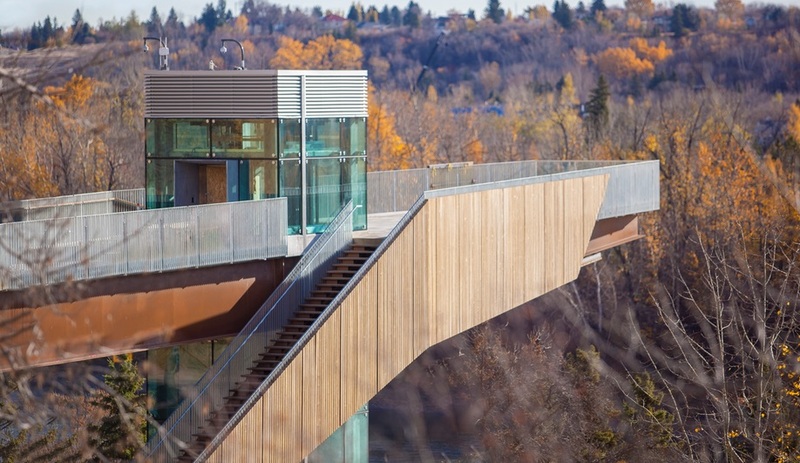 After crossing a pedestrian footbridge over Grierson Hill Road, visitors are transported to a 20-metre high cantilevered lookout facing the North Saskatchewan River. 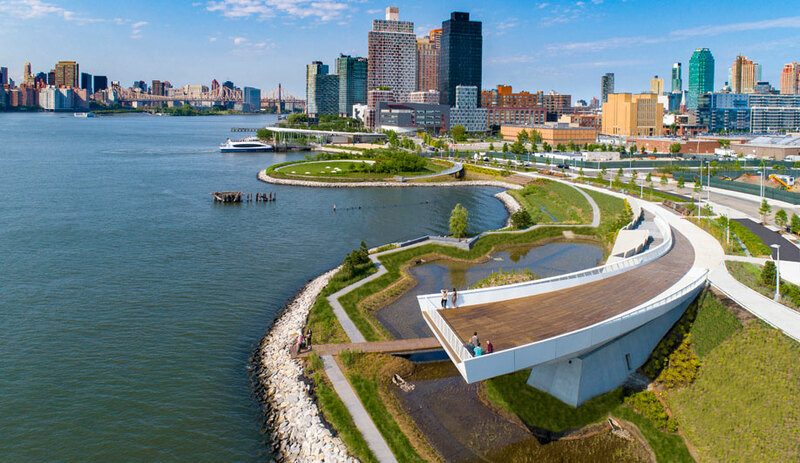 It’s already become a favourite among photographers, both for its natural and city views.